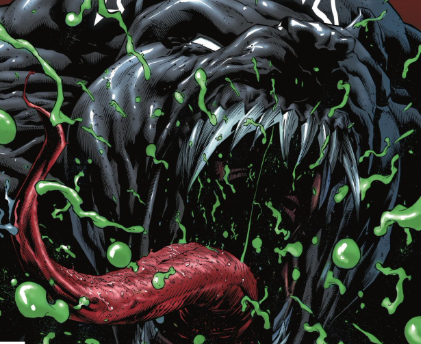 Venom #9 review: Morose monster madness – AiPT! The smash hit of the summer continues with…VENOM NO MORE?! ‘Nuff said! Donny Cates has been writing an excellent Venom series in part because it’s so filled with new ideas. Hell, even in this issue there’s a clever use of a dog to allow Eddie to transport the Symbiote via bus. This issue also has Ryan Stegman back on pencils who draws a Venom series that is dark and brooding. This issue delves into Eddie’s mind as he thinks about the current state he is in after losing his closest confidant. Hell, maybe they were even lovers. Cates writes strong captions that delve into his subconscious, pull up old memories, and give you a good impression of where Eddie is before he talks to his father. A father who was abusive and lacks any understanding of what Eddie has been through. Basically, Cates has thrust Eddie into a situation he can’t manage under the emotional state he’s in. This leads to conflict, of course, and plenty of Symbiote chomping action. The biggest takeaway, however, is how Cates has framed Eddie in this sad place and dealt him a choice to make at the very end of the issue. Given how well Cates draws us into his mind I can’t argue whether Eddie can even fathom what he should do. Stegman draws this issue quite well. Who doesn’t want to see a dog covered Symbiote, am I right? There are some striking flashbacks used here too which help draw us into Eddie’s mental state. The man is sad and you feel that. There are also some impressive things Stegman does with the Symbiote thanks to the current mindless state of the alien. The thing is a real horror show, something out of a monster movie, and when it strikes it’s impressively rendered. Thanks in part to Eddie’s state of mind the narrative is a bit sleepy, slowly revealing its plot and moving at a slow pace. I’m sure some fans will shout, “Get it together and do something Eddie,” and the pace of the issue doesn’t help matters. I almost think Cates keeps up the morose melodrama too long. Eddie is going through an emo stage and I’m loving it. I kid, but seriously, Eddie’s emotional struggle is vividly real and well written by Cates. Stegman puts the icing on the cake with some monster madness moments. Eddie’s emotional struggle is vividly real and well written by Cates. Stegman puts the icing on the cake with some monster madness moments.